A FIRST-CLASS Wrexham travel agent team is celebrating a bumper haul of top awards. 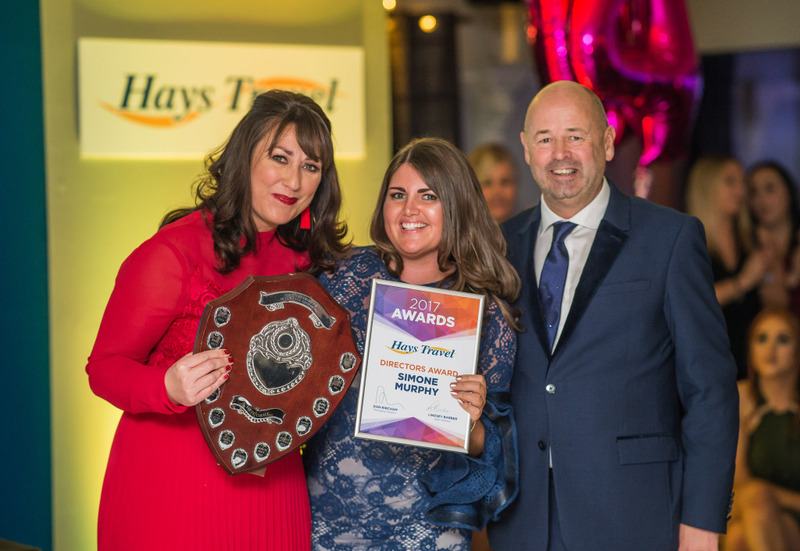 Simone Murphy, Manager of Hays Travel in Wrexham, scooped one of the top prizes for a second time at a glittering awards ceremony hosted annually by Hays Travel North West Managing Director Don Bircham. His aim is to celebrate the achievements of his 150-strong team across almost 30 stores in the North Wales and North West region and it was hosted this year at The Holiday Inn, Chester West, in Mold. For Simone, it was the second time in her 12-year career with Hays that she took home the Directors Award for Outstanding Contribution. The night continued to be a success for the company’s head office base in Lord Street with high-flying apprentice Dion Hanmer, 19, scooping the prize for Apprentice of the Year. Their fellow team member Rebecca Booth was also named as the fifth best performing travel consultant for the firm which announced a major recruitment drive at the end of last year. Simone, 28, who began her career with Hays as an apprentice, said: “I won the Directors Award back in 2013 and it was a huge honour. To win it again is amazing. I’m shocked. She added: “I’ve always wanted to be involved in travel since I was young – whether that was as a holiday rep, air hostess or travel agent. “I became an apprentice travel consultant in 2005 and got the bug from there. “I tend to book a lot of long haul for customers because I’ve got a lot experience in that area. I’ve been to those places myself. “It could be the Caribbean, Maldives or safari. Vietnam is very popular at the moment. Then there is South Africa and I’ve pretty much travelled everywhere in America. “I can provide that personal knowledge to customers – where to go, where to eat. 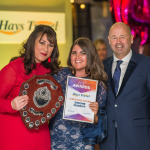 Don Bircham, Managing Director for Hays Travel North West, said: “One of the main secrets to our success is the first-rate service which our valued staff, including Simone and her team in Wrexham, give to our customers. “At the heart of what we do is to give sound, independent travel advice and to listen to what our customers want so we book fantastic holidays which they will have looked forward to for months. “The aim of our annual awards is to reward the hard work which goes on to make this happen which in turn ensures the company thrives. “The firm has had a phenomenal 12 months, breaking through the £50m turnover target for the first time and this is down to the hard work and dedication of our loyal staff. “I’d like to congratulate Simone on her award and the high class service she continues to provide, along with her team in Wrexham. “I’d also like to give special praise to Dion who in her first year as an apprentice has achieved so much. 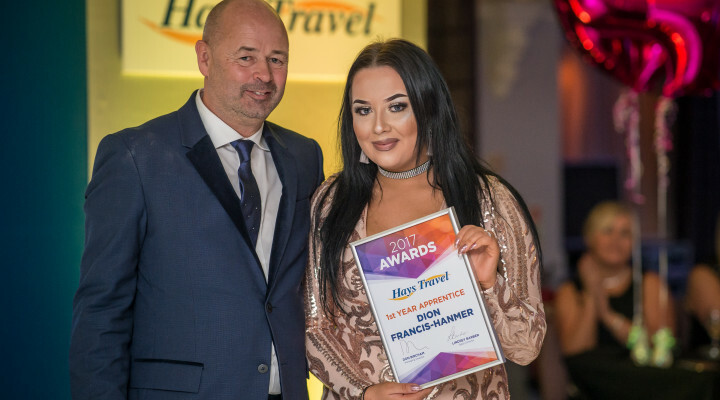 Dion, who lives in Pentrebychan and is a former Ruabon High School student, joined the eight-strong team at Hays Travel in Wrexham in August 2016. She said: “At the start of the year I made it my aim to be apprentice of the year. I’m so happy. “Travel was what I always wanted to do and I was delighted when I got the job. I’ve settled in really well and enjoy working with everyone. “The whole team has been so supportive. Simone is a great mentor for me and it’s just such a good company to work for. “I love the job. I’ve travelled to Mexico, Cyprus and Turkey during the past year and it really helps to have that experience when selling a holiday to that destination. “Dealing with the customers is one of the best bits of the job. I love it. I’ve helped people with a mixture of holidays over the year ranging from short haul to long haul and cruises. Wrexham office manager Simone added: “We’re all so very proud of Dion. We all work as a team here and push each other to do well. “It’s so rewarding to see them develop, 100 per cent. I’ve been on that journey myself and I enjoy being able to pass on my experience. “Although we have an experienced team here at Wrexham we also have three apprentices in there. We really like to train them up and then recruit from within. We like to see them get promoted. “We give them first-hand knowledge and train them up in store. Dion for example had never had travel experience until she came here. “She started at 17 and is out training with the other apprentices twice a week but the best training she gets is out on the shop floor. Hays Travel North West is the UK’s fastest growing independent travel agency and is set to open 12 new branches across the North West and North Wales by the middle of 2018. A recruitment drive was recently launched to take on 60 new staff as part of the major expansion plans. To contact Hays Travel North West about current and upcoming job vacancies, email recruitment@hays-travel.co.uk or call 0800 215 5045. This entry was posted in Business, Featured, News, Tourism. Bookmark the permalink.